PLEASE NOTE: The following report is spilt into 2 sections. My story is first, with Abril once again adding her thoughts at the end. So Enjoy! Every year for my birthday I try to plan out some sort of long distance train trip. 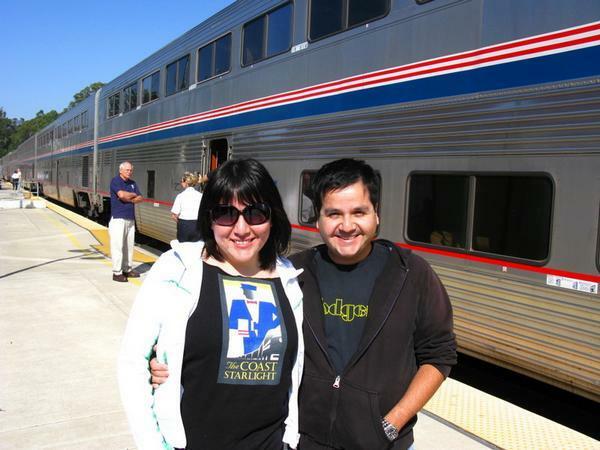 Last year Abril & I headed out to La Plata Mo on Amtrak train #4, the Southwest Chief. This year I decided that I wanted to ride the newly re-launched Coast Starlight all the way to Seattle! We were booked out of Los Angeles on Sep 13th with Sep 12th being our travel day to Los Angeles. That evening we would make the drive over to San Diego from Mexicali, then take the last Surfliner north into LA. On our drive over to San Diego my brother Albert had phoned me asking if I had heard about the Metrolink crash in Chatsworth. I had not heard anything about the crash since most of my rail information comes from trainorders.com and I had only spent that morning on the computer. The horrific head on collision happened on the route that both Coast Starlight�s use to get in and out of Los Angeles. We would continue on to Los Angeles not knowing if our trip would be cancelled since there would be no way for trains to make it thru that crash site. The only alternative I could come up with was having to maybe bus up to Santa Barbara and meet the train there. Well on our northbound Surfliner trip I received a call from an Amtrak representative stating exactly that. Once in LA we were off to our hotel for the night, the Metro Plaza right across the street from Union Station in China Town. The next morning we awoke pretty early. I wanted to have enough time for breakfast at Philippe's! In my opinion, 2 French Dipped Beef sandwiches are the perfect balanced breakfast to start any day..:) After breakfast we checked out of the Metro Plaza, then made the short walk over to Union Station. We were both anxious to see just how organized Amtrak would be with this whole Coast Starlight situation. Once in Union Station we headed over to the Traxx Bar Lounge which is used for Sleeping Car Passengers. There we were instructed that our busses to Santa Barbara would arrive in about 45 mins. One thing I liked was that our busses would be for sleeping car passengers only. We would also be taken directly to Santa Barbara where as all the other busses had to make all the intermediate stops to pick up additional passengers between LA & Santa Barbara. Once aboard the bus we were given a free copy of the LA Times along with a couple of snack packs complete with bottled water. The trip over to Santa Barbara took about 2 hours. Once off the 101 Fwy and near the Amtrak station I waited anxiously to finally spot our train sitting in the station. The first thing I looked for was to see if our train had a Pacific Parlour car in it�s consist. It DID! Now off the bus I noticed that the train was backwards. The baggage car was bringing up the rear w/ the locomotives coupled up front to the coaches. For this trip, Abril & I were booked in roomette #4 in the 1432 Sleeper. Marisela would be our sleeping car attendant. We immediately found our car and headed up to our room to get settled in. Our departure from Santa Barbara would be @ 12:48 PM. We still had over an hour to wait after all there were still a number of busses in route from Los Angeles with more passengers. During our wait to depart I took the time to take a few photos of our train and also to check out our Parlour Car - Sonoma Valley from the outside. I was excited since this would be my first ride in one! Train # 14 The Coast Starlight @ Santa Barbara Ca! With everyone now on board we slowly pulled out of Santa Barbara! After spending a little bit of time in our roomette we decided to head on over to our Pacific Parlour Car. 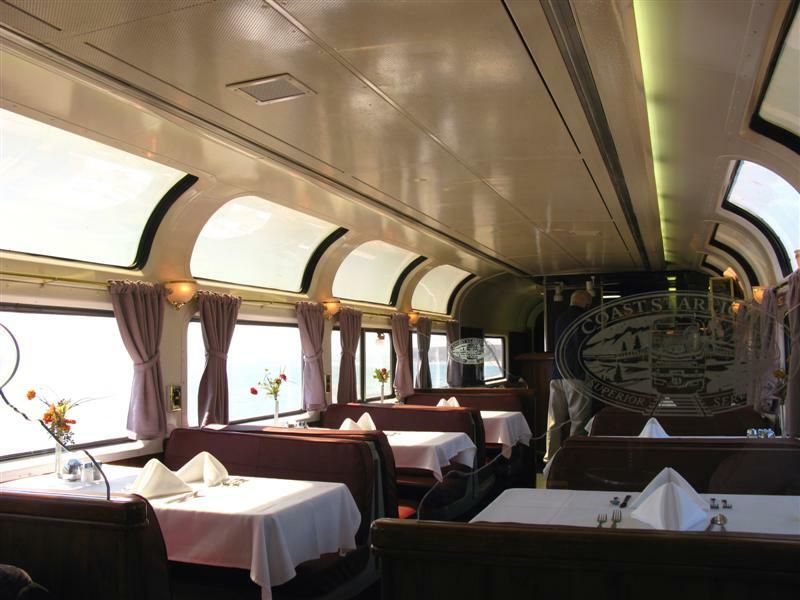 The Parlour Car for those that don�t know are Ex � Santa Fe High Level Lounge Cars. Amtrak took 5 of these cars and fully refurbished them for use on the Coast Starlight route. They truly are beautiful cars! Upstairs you have comfortable swivel seats as well as tables that are used for meal service. A Parlour Car attendant is on hand to handle drink and appetizer orders. Downstairs the Parlour Car hosts a small movie theater w/ a nice flat screen plasma TV available to show the movies offered that day. Abril & I would find a couple of seats upstairs where we would enjoy the beautiful California Coast line for the next few hours. The Pacific Parlour Car - Sonoma Valley! Train #14 @ San Luis Obispo Ca! Abril & I : San Luis Obispo Ca! A few hours later we would arrive at our station stop of Salinas Ca. This would be another fresh air stop for the Coast Starlight. Out of Salinas I noticed the sun starting to set. The scenery out here was mostly agricultural and it was nothing new to me since that�s what I�m used to out in Imperial Valley Ca. Roman would soon come by our roomette to take down our evening dinner reservation. We had decided on the last available time which ended up being 8:45PM. Now in San Jose our train held here for about 10 min or so. From our roomette I was able to see a CalTrain arriving from San Francisco. I could not believe the amount of people coming off this train here in San Jose but for a SAT night I guess it�s pretty normal! A few minutes out of San Jose we headed off to dinner. Since it was the last seating of the evening we had the whole table to our selves. For dinner Abril & I had both decided on the lasagna and I have to admit it was pretty good. After dinner it was back to our roomette. I was getting tired and since I had not slept well the previous 2 nights, I knew my time awake was numbered! Marisela would soon come by and I would have her make up our beds for the evening. Our train was now making its way up thru the East Bay. A few mins before our arrival into Oakland I noticed the McAfee Coliseum off to our left. This stadium is home to both the Oakland Raiders & Oakland Athletics! With Abril now in the top bunk and me looking out our roomettes window, the next few station stops came and went. Last thing I remember was, after leaving Emeryville, the sight of a large highway bridge lighting up the sky and shining out over the water that our train was now skirting. After that my eyes were to close and not open again until the following morning. The next morning I awoke with a beautiful green forest now outside my window. Our train was now in the state of Oregon and soon we would arrive at our next station stop of Klamath Falls. Here our train would have to wait about an hour and a half since the Union Pacific Railroad was doing track work in the area of where the January Frazier Slide occurred. Abril & I quickly showered and changed so that we could get some air and check out the Klamath Falls station area. Outside we would walk the entire length of the train quickly coming to the front where the locomotives were. On our way back we stopped at the coach car which had the video game machines in it. I made sure to change a dollar into tokens so Abril could at least try the games out. I of course took some pictures! With our train now cleared to continue its trip north we departed Klamath Falls now running about 2 hours behind schedule. Believe me when I tell you that being behind schedule did not bother us one bit! Now in the next few hours our train would travel thru some of the most beautiful area Oregon has to offer. The train makes its way up thru the peaks of the Cascade Mountain range. In was in the area of Frazier that, back in January, a huge mud slide took out part of Union Pacific�s main line. When we finally made it up to the slide zone I could not believe the enormity of it all. Basically Union Pacific had to re-construct the side of the mountain that had collapsed. This undertaking would last them a few months! As our train continued to make its way up, then down the mountain side, we decided to head off to lunch. I had also purchased a couple of $5 tickets so we could take part in that afternoons wine tasting. The wine tasting is done once daily and it takes place in the Parlour Car. Since I quit drinking about a year ago I would just sit in with Abril and enjoy the cheese & crackers. Abril on the other hand would sample all the different wines. (Be sure to read her report down below. I�m sure she will comment on the quality of the wines.) I found the wine tasting quite interesting to be honest. The Parlour Car attendant gives you all the information about each wine being served, where its from, what type etc.. He also talks a bit about the history of the Pacific Parlour car. Finally he mentions that he has Coast Starlight branded souvenirs for sale. These consisted mostly of t-shits though. I made sure to ask him if he had any Coast Starlight license plate frames available and he said NO. I think he mentioned that those frames are not available anymore and that I might find one on EBAY! Well I don�t want one that bad. Actually I wasn�t looking to get one. I just wanted to see if he had any available for purchase! One other thing � I forgot to mention that our sleeping car attendant, Marisela, was on hand during the wine tasting. Her job was to pour the wines out for everyone attending. I hear this is pretty standard practice now on the Coast Starlight w/ sleeping car attendants each taking turns lending a hand during the daily wine tasting. After the wine tasting we decided to head back to our roomette. From the selection of board games available to passengers in the Parlour Car, we had taken Monopoly back with us and decided to spend the next hour or so playing! 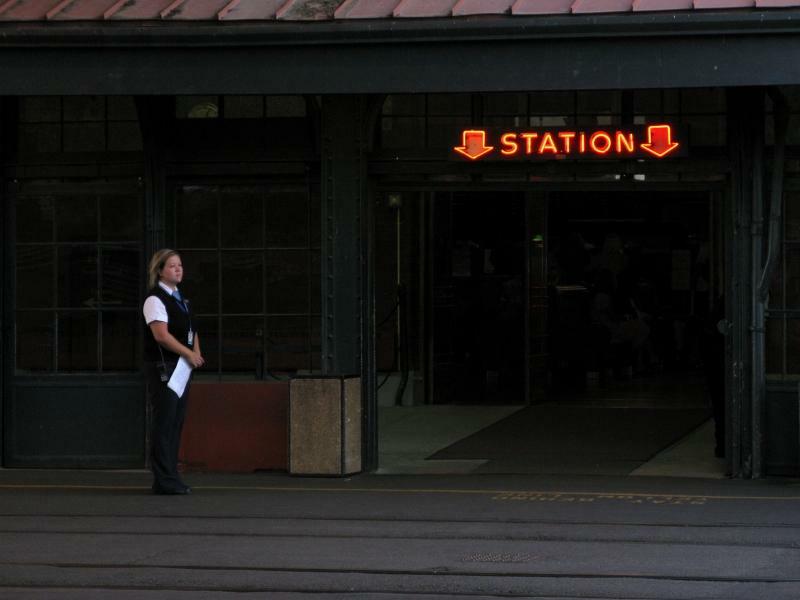 During our game we would come to the station stops of Chemult & Eugene Or. Leaving Eugene I noticed we were still running about 2 hours late. I also noticed that our train was now running thru more populated areas of the state. In a few hours we would be arriving into Portland Or. As we approached Portland our train makes a sweeping left hand turn across the Willamette River. Directly across the river we came to a stop at Portland Union Station. Entrance To Portland Union Station! It was almost 6PM when we slowly pulled underneath the train sheds of the station. Here we would have a short time to get out and stretch. I made sure to walk around and take some pictures. I really liked how the whole station was laid out. The thing I liked the most were the neon colored signs used to direct people to certain locations. This was a nice touch I thought. Kind of reminded me of the type of signs you might see in the old time train stations of the 50�s & 60�s. Now since our station stop was shorter then usual our train would soon pull out of Portland so that we could continue our journey north to Seattle. Our trip aboard the Coast Starlight would soon come to its end and we really wanted to enjoy our final hours aboard the train. Now on the move again we would soon cross into the state of Washington. The sun was setting and unfortunately we would not get to see much scenery from here on out. For dinner on our last night we decided to have it in the Pacific Parlour Car. That evening�s selection was a choice of either scallops or bbq beef w/ us both deciding on the beef dish. Our Parlour Car attendant would quickly serve us our dinner accompanied by salads and dinner rolls. The one thing I liked about eating in the Parlour Car is that the meal selections are different then what�s available in the standard diner. Even the desserts were different selections. After dinner, we decided to spend the last few hours of the trip back in our roomette. We were now running in darkness and it was pretty hard to make out what was what outside our window. According to the Amtrak Coast Starlight route guide, we were running along side the Puget Sound on our approach into the Pacific Northwest. The time was now 9PM and I wanted to take a quick nap before our arrival into Seattle. I took down the top bunk and climbed on in. I must have slept for a few hours because I totally missed our station stop of Tacoma and before I knew it the announcement was being made that our arrival into Seattle was imminent. Our arrival into Seattle was pretty neat. We came in right around 11:30 PM (over 2 hours late but once again we didn�t mind) and I couldn�t help but notice how beautiful the sparkling Seattle skyline looked! Once off the train I made sure to thank Marisela for taking good care of us on the trip. We would then slowly make our way thru King Street Station and once outside, we searched for a taxi cab. Our cab would be taking us to the near by Moore Hotel where we would retire for the night. Abril and I would spend the next day in Seattle pretty much sight seeing and visiting the city�s key attractions. We made sure to visit Pike Place Market (my personal favorite), Carkeek Park, the Seattle Aquarium and also took a harbor boat cruise around Elliot Bay. It was truly an exciting fun day and I have to say that Seattle remains by far one of my favorite cities to visit. I just wish we had more time to explore since the next day we would have to fly back home bringing another great trip to its conclusion! This was one trip I was anxiously waiting for! Seattle is a city I find interesting and to know we were going there made the day before our trip long. Tony planed this for months and the day before our departure, a sad and tragic rail accident happened near LA. It was around 7pm when he told me the news; we were just heading to San Diego and couldn�t believe it. This wasn�t something that will be cleared in just one day. Tony was waiting for the worst but I kept my hopes up. I didn�t think our trip would be canceled. . . Finally Amtrak decided to have all passengers picked up at Santa Barbara, so our plans got back on track! We awoke early to get to LA Union Station. In the Traxx lounge we enjoyed a cup of tea as we waited for our call to board one of Amtrak�s buses. I think we took the last bus for sleeper passengers since it was almost empty. It was a 2hour bus trip to the Santa Barbara Station. You could see all the people waiting outside and boarding the train. We rapidly got in our sleeper and settled in our roomette, anxiously waiting for the train to depart. When the train started to move I felt excitement for the start of our new trip together. Minutes later we went to the famous Parlour car. It was really nice and classy. We enjoyed the sight of the coast of California from the comfort of a re-upholstered chair. When the time for lunch came we went to the Diner car and each had a Hamburger - It was pretty good! Plus it was our first meal in the train and it�s always a treat to have a beautiful view when you�re eating. Passing San Luis Obispo we got more relaxed, viewing the beautiful scenery from our sleeper room and later I took my afternoon nap. It was around 7pm when we arrived at the San Jose station. I stayed in the room, meanwhile Tony got out to take some pictures. Minutes later we got our call for dinner in the Dining car. We both had Lasagna and it was really good! Kudos to the chefs. . . Satisfied with our dinner, as we were going through the Parlour car there was a cabinet with lots of board games and books so we picked the Trivial Pursuit game. We played for a half an hour or so and each could only answer one of the questions. I guess this was Trivial Pursuit genius edition, hehe. After a little fun we got back to our room and asked for our beds to be made. It had been a long day but we were very happy to be riding the train. The last thing I saw was, when we were passing, Jack London Square. It was around 11pm and soon I was lost sleeping. When I woke up we were near Cascade Summit! It was such a beautiful view - a lot of pine trees, all green as far as the eye could see. We we�re now going kind of slow at this point because of a landslide that happened January of this year and there where a lot of Union Pacific employees working in this area. But for me it was ok - you could enjoy the scenery for a longer period of time this way! When it was time for lunch we headed to the beautiful Parlour car and got pasta. I was looking forward to having something to eat in this car, since I knew not everyone has the luck of having a Parlour car, because many times the cars are out of service for one reason or another. It was good but an hour before this we got to participate in the wine tasting! It was just 5dlls and you could try three red wines and three white all from Oregon since we were going trough this state. My favorite was a white one, it was the sweetest of all but I don�t remember the name so if someone can let me know I would really appreciate it. When we got to Eugene it was surprisingly hot outside but we just stayed here a couple of minutes and got back inside to continue our travel. Now we were heading to Portland and closer to Seattle!! It was very interesting to go across Portland, you could see the Willamette River and the station here was also nice with the words "GO BY TRAIN" on top of a clock tower. We were here for about 15minutes and as the train moved forward my excitement for being in Seattle was growing. For our last meal on board the train, as well as in the Parlour car, we had some sort of barbeque beef with potatoes - it was really, really good! Again, congrats to the chefs! It was now near 11pm when we finally arrived in Seattle. With all the people outside waiting for a cab it was kind of hard to get one, so we decided to walk one block to get a cab faster. Our hotel was very close so we quickly checked in and soon we were taking a deep sleep. 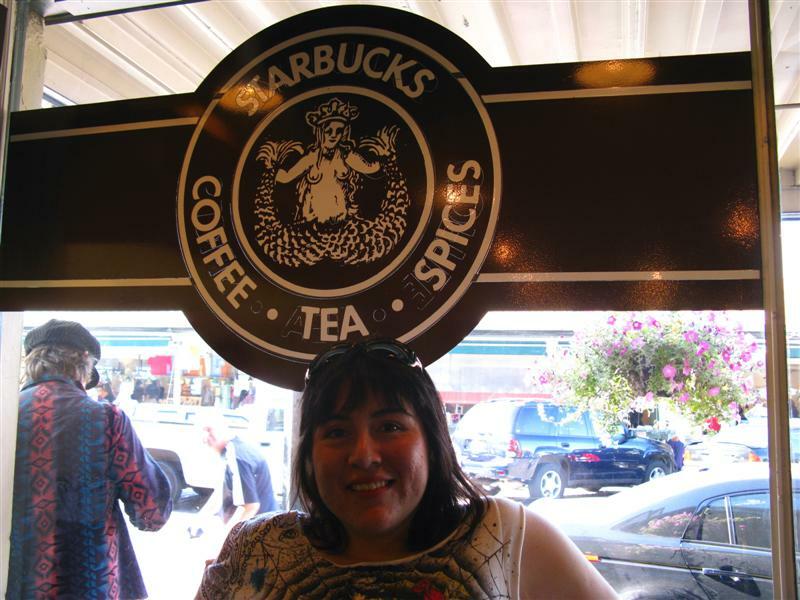 Our first destination in the morning was to visit Pike Place Market; there we entered and saw the first Starbucks which was established in 1971. Then we headed over to have breakfast in a cool place with a nice view of the bay. Part of my breakfast consisted of a smoked fresh salmon. Best salmon I have ever had! We took a walk trough the market and I was really amazed with all the fresh food you could find. Everything from organic fruits and vegetables, all kinds of beef jerky in different flavors, of course seafood, flowers, spices, pastas, etc, etc. I wish there was a place like this near home. You can find many different things from many different parts of the world here. After visiting this awesome market we went to the Seattle Aquarium and got a combo ticket that included a one hour harbor cruise tour. Being in the Aquarium was really great; my favorite animal was the sea otter and I think that for Tony it was the seahorse. When it was time for the cruise we walked one block to get to Pier 55 where our boat was waiting. On this cruise I could see Seattle from another point of view also learning from our tour guide, who was narrating some interesting points and also history of the construction of the buildings you could see from the boat. Towards the end of the tour we noticed some happy sea lions enjoying the sun on a big buoy. When our tour ended we headed back to the Market and decided to buy stuff for a picnic. First in a German deli we bought the cheese and ham - then in a French bakery got the bread. All this for our next stop of the day to Carkeek Park. . . Everything was perfect, the sun was warm, you could feel the breeze of the sea and our sandwiches were delicious! I really enjoyed our evening here; plus I love the sea, it makes me feel calm and happy. . . I could have stayed here all day. And I know Tony too since you could see trains going north and south every hour or so. Late in the evening we looked for a sports bar. I had two beers while Tony enjoyed Monday Night Football. Around 9pm we went back to our hotel. Our next and last morning of this trip, we headed again to the Market, this time to look for a few souvenirs. Then Tony decided to take a last minute drive across the city. We visited the Union Station building, which was used as a train station until 1971. Then we drove to Lake Union where there was a trail along the lake where people could be walking or jogging. Back in the car, we continued on, this time going south and heading towards the airport. Seattle has been one of the coolest places I have visited and I am really looking forward to taking this trip again and luckily next time our train will once again have a Parlour car!